Today (Monday, December 17th) is the last day to pick up your exemption stickers. You will get them from your AP office during lunches. The library will not be open for extended hours this week. Congratulations to Tara Spirdco as she signs her Bowling Scholarship with Louisiana Tech today in the library during advisory! Who wants a free yearbook? Text your parents right now to like the Facebook page @LakeRidgeYearbook. We'll draw a winner from our Facebook followers on January 1st. 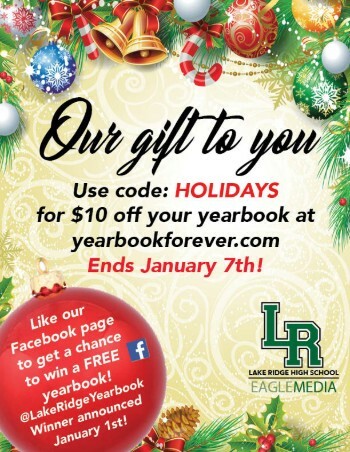 Also, order your yearbook now and use coupon code HOLIDAYS to get $10 off through January 7th. Go to yearbook forever.com to order your yearbook today! All TCC students must return their first semester TCC textbooks to Mr. Romaguera in the book room. Today and Friday are the last days to return textbooks before fines are assessed.